When reflecting on our tricentennial and our history, it is important to remember that without Bienville, there would be no New Orleans. 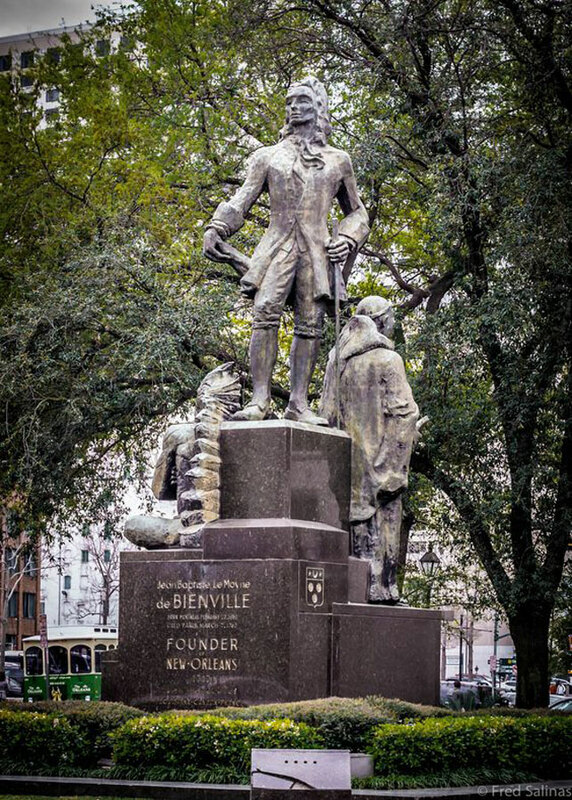 Enjoy a stroll over to the 400 block of Decatur Street to view the statue erected in 1955 to honor a French-Canadian explorer and colonizer, Jean-Baptiste Le Moyne, Sieur de Bienville. He founded New Orleans on a crescent-shaped piece of high ground in the bend of the Mississippi River, a place that he felt would be safe from hurricanes and tidal surges. After moving into his new home on the site of what is now the Custom House, he named his town La Nouvelle Orléans in honor of Philippe II, Duke of Orléans, France’s Prince Regent, and proposed that the new capital of the colony be built there. Permission was granted, and Bienville officially founded New Orleans on May 7, 1718. Originally, our walled village now known as New Orleans was centered around the Place d’Armes, which is now Jackson Square. Two engineers laid out the first streets of the Vieux Carré, or the Old City, naming the streets after royalty in the Duke’s court. Trappers, Indian hunters, and German farmers often traded in a clearing near the river that is now the French Market. By 1723, it became the capital of French Louisiana, and Bienville was appointed the governor of French Louisiana four times because he was so well respected. Our city is known for having our fair share of swindlers and con artists--pirates, riverboat gamblers, politicians, and that guy you likely met on Bourbon Street who bet you he knows “where you got your shoes”. You could say that Bienville was one of the best con men of all. The lucky and brave nineteen-year-old was able to trick a whole warship filled with English settlers to turn around and “get out of Dodge!”. In 1699, he was headed down the Mississippi River from his camp in two canoes with his crew of five men when he encountered the English warship, the Carolina Galley, with ten cannons and many settlers. He paddled over and lied to the English captain, saying that the land had already been claimed for France, as they had already built fortifications there, and they were prepared to defend it. The captain, Louis Bond, was easily bluffed since he had previously been imprisoned by Bienville’s brother and naval hero, Iberville, in King William’s War in Hudson Bay in 1697. He quickly and immediately turned his warship around and headed out toward the Gulf. The bend in the river where this biggest bluff of many centuries occurred is just south of New Orleans and is now called English Turn. Soon, the French were motivated to actually build forts on each side of the bend in the river there, giving them control of the mouth of the Mississippi River, the virtual front door to America. Who knows how American history may have unfolded if not for the nerve of this teenage con man whose statue now stands watch bravely on Decatur Street looking downriver toward English Turn? Hats off to you, Sir!